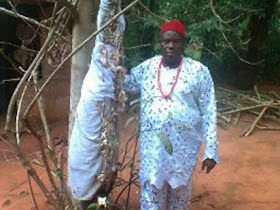 Strange information is coming out from Ire-Inwelle Ogidi community, Idemili North Local Government Area, Anambra state.The chief priest of all the shrines and oracles in Inwelle Ogidi community, Chief Felix Obika hinted that Governor Obiano is a traditionalist who respects the ancestors and believes in the efficacy of the spirits, oracles and deities which earned him victory for All Progressive Grand Alliance, in the state House of Assembly.He said the spirit world did it for Governor Obiano as a way to enable him relax and continue in his infrastructure development of the state. Obika said: "On assumption of office the Governor vowed to sack kidnappers and armed robbers who have been terrorising the state and he had the support of the gods that helped him to clear them. Obika who will celebrates his second Ofala festival come next Saturday April 25 revealed that it would mark the end of Igweship crisis in Ogidi and commencement of the installation of a new traditional ruler for the people. "Ogidi refused to know their ancestors and it is the reason why they have no traditional ruler but after this 25th April Ofala this month, in this Ire Inwelle shrine, the Igwe will be produced", he hinted. The Ofala, he said will unite the people and make them to love themselves for the emergence of a king that will be a wealthy youth. "On that day people who have been blessed by the gods will come with all manners of gifts as thanks-giving for being blessed. Some promised to build houses, purchase vehicles, cows, sheep and other gifts as a reciprocal to what the gods did to them", he disclosed. In their various remarks, the legal adviser to Ezechumagha, father of Ogidi –Inwelle, Patrick C. Agbata and Chief Obi Anyansi Ezenwamadu, said that the Ofala is a transition for the better adding that the Igwe to be would be a wealth, educated youth. "The contest for the Igweship position will be thrown open for those who are equal to the task as it is not for selfish people," they stated.